You can add a new board by selecting the + (plus sign) from the top right corner of your boards list page. Name your new board, select which organization it belongs to (if applicable) and choose the visibility settings for the board, then select "Create" to create your new board. 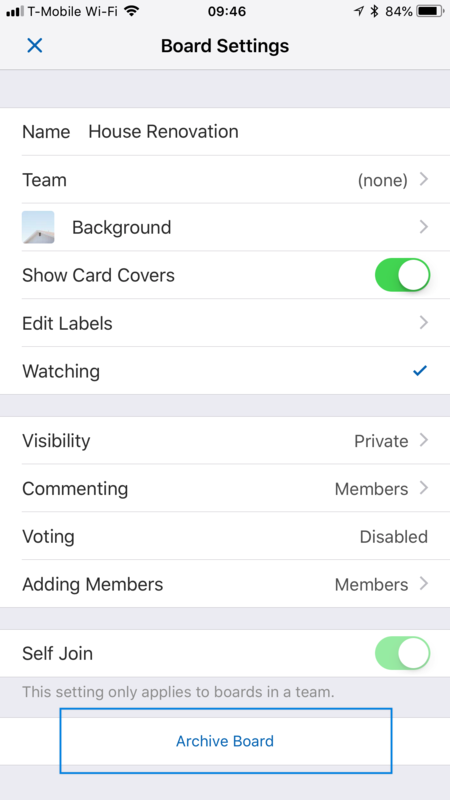 By default all newly created boards will be set to private. You can select "Visibility" to set the visibility of your board to either private, public, or organization (if the board is associated with an organization). Please note that public boards are viewable by anyone with a link to the board and will be searchable in search engines like Google. To change your board's settings, open your board and select the "..." icon in the top right corner of your board. This will open the board's sidebar. From the sidebar, you can star a board (by tapping the star icon), view archived cards/lists (by tapping the file box), and change board settings (by tapping the gear icon). To edit a board name in Trello, open the board and tap the title. Start typing the new name for your board and tap Done when you're finished. To archive a board in Trello, first open the board you would like to archive. Then, open the board's sidebar ( the “...” icon in the top right of the page), and select the gear icon in the top right of the page. From there, select "Archive Board" at the bottom of the settings. 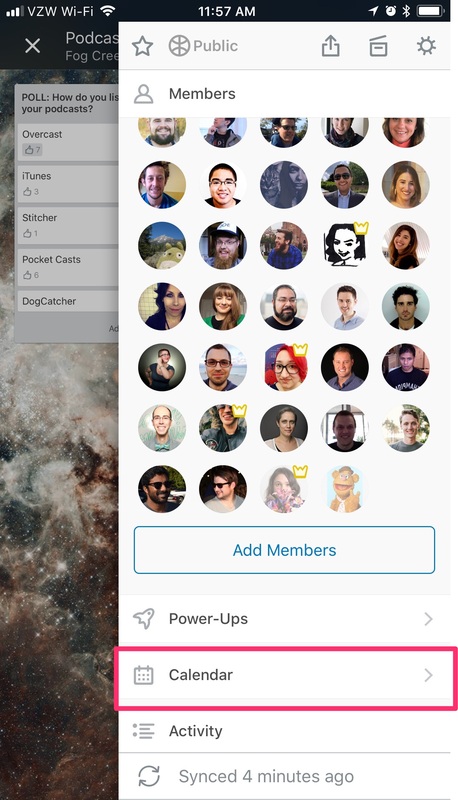 The Calendar, Custom Fields, Maps and Voting Power-Ups are available in the Trello app for iOS. You'll need to make sure you haven't reached your Power-Up limit (1 for free users, and 3 for Gold users) before enabling any of them. 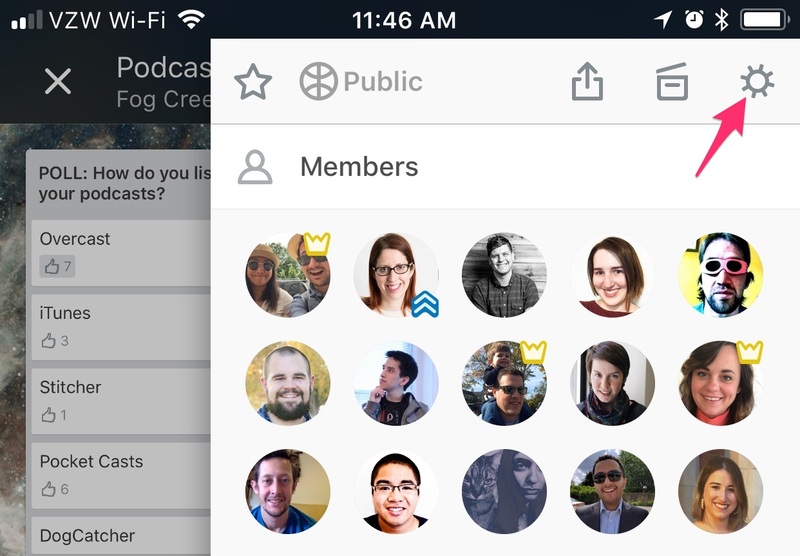 Enabling them in the iOS app will also enable them in the web and for all other members of the board. First, go to the board menu by tapping the 3 dots in the upper right hand corner of the board. Then, below the board members, you'll see the Power-Ups menu. Tap on that and you'll see the toggle for each Power-Up. When enabled, you'll see the Calendar option below the Power-Up menu in the board menu. Custom Fields and Voting will appear on the individual card as an optional item. The Maps Power-Up is only available in our mobile apps. When you’re viewing board, you can zoom in on a list so that it fills the whole width of the screen by tapping the list's name or the blank space underneath the list. To zoom back out to the view more of the board, tap the board background.